1 Pediatric Intensive Care Unit, Shanghai Children’s Hospital, Shanghai Jiao Tong University, Shanghai, China DOI : 10.24953/turkjped.2017.02.008 Yan YM, Gong M, Chen JL, Li D, Xu TT, Zou H, Li AQ, Fan QL, Lu QF. 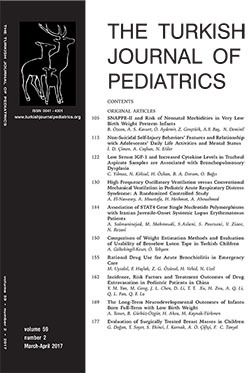 Incidence, risk factors and treatment outcomes of drug extravasation in pediatric patients in China. Turk J Pediatr 2017; 59: 162-168.